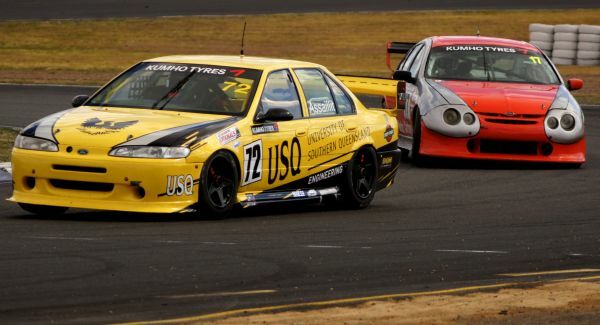 USQ Racing’s Nathan Assaillit had the speed in the Kumho Australian V8 Touring Car round at Queensland Raceway but the results didn’t go to plan. Assaillit was racing in his first Shannons Nationals round with the Kumho V8 Touring Car Championship in an ex-V8 Supercar EF Falcon. The Falcon was the oldest car on the grid but Assaillit was producing competitive times. ‘The car had plenty of pace over the weekend, which we proved by qualifying in the top 10 in the competitive 17 car field,’ Assaillit said. Race two would be kinder to Assaillit but a controversial incident would dampen the ninth place finish for Assaillit. In the final race, Assaillit again started from the rear of the field. After successfully moving his way through the pack, Assaillit was set for a top five result until an engine failure put the USQ Falcon out of the race with only 3 laps remaining. The weekend wasn’t entirely bad for Assaillit, however, as he had been awarded Elite Athlete status by the University of Southern Queensland. Assaillit is completing a Bachelor of Engineering (Mechanical) at USQ and will now benefit from the advantages that sportspeople can earn while studying at an elite athlete friendly institution. The Elite Athlete Friendly University (EAFU) Network was established by the Australian Institute of Sport to assist athlete achieve their sporting and academic potential. USQ is a member of the EAFU. Assaillit will continue his USQ degree while competing in the USQ Falcon at further races in 2012.